Sunset Scenery; Where to find some of the best sunsets in Ontario. 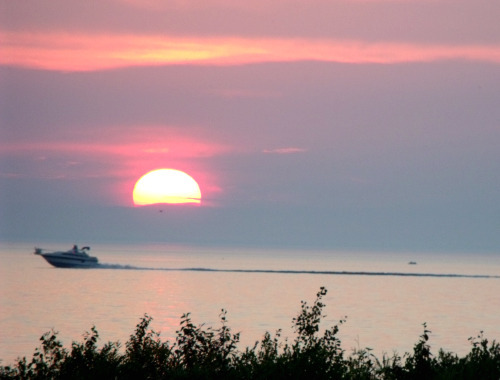 There is scientific evidence that Lake Huron's sunset scenery is some of the best in Ontario. Ideal atmospheric conditions including dry smog free air and communities facing westward lead to consistently amazing sunsets. 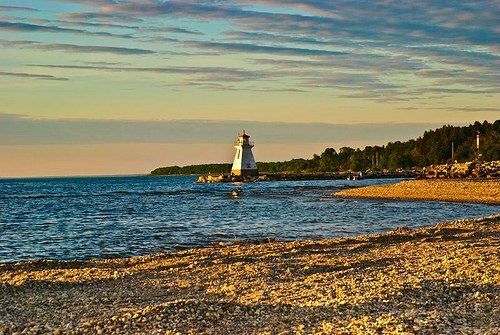 Add to the fact that the town of Southampton in particular has Chantry Island as its sunset backdrop you have sunset magic. Many tourists and cottagers spend Friday nights in the summer watching the sunset over water. Listen to bagpipes pipe down the sun at the large flag in Southampton's downtown. From the flag take a walk towards Gerry's fries and further to South Beach. Stop, sit on one of the benches that line the sidewalk in memory of those that loved Southampton sunsets and take some beach sunset photos. As the summer comes to a close in August and the sun sets earlier in the evening, take a walk along paths parallel to the shoreline road in the township between Southampton and Port Elgin allows you to watch the sunset from a different vantage point. I have been lucky enough to witness some spectacular sunsets that range in colour from orangey red to pink and a purple sunset. The above video is a real time depiction of the sunsets in Southampton Ontario. While similar conditions making for great sunsets will be present all along the Ontario Lake Huron coast, what makes for the best sunset is an island on the horizon like those in Oliphant (Fishing Islands) and Saugeen Shores (Chantry Island).